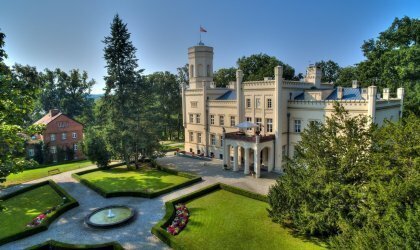 Mierzęcin Palace Wellness & Wine Resorts is an elegant holiday complex where the spirit of history discretely interweaves with modernity. 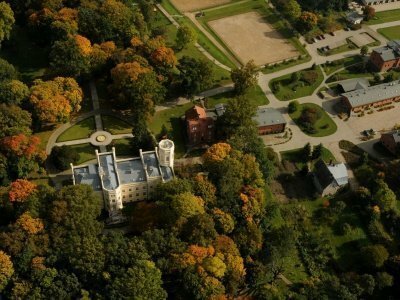 Located in Lubusz Voivodeship, halfway between Poznań and Szczecin, the Palace is surrounded by picturesque parks, forests and lakes, which enchant with their inimitable beauty and let one savour the charm of every season spent at Mierzęcin. 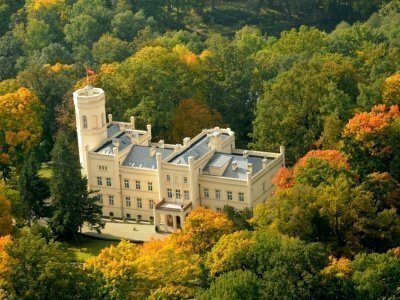 The Palace – together with a manor, third largest vineyard in Poland, a winery, a stud farm and the Grape SPA – offer its Guests a wealth of possibilities to spend unforgettable moments in a place full of charm and unique atmosphere. 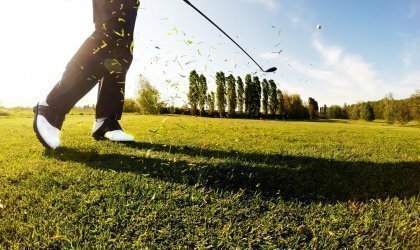 People who like to actively spend their leisure time as well as people who value tranquillity, families with children or business clients will all find an interesting proposition for themselves. Wine is a passion here and a lifestyle. 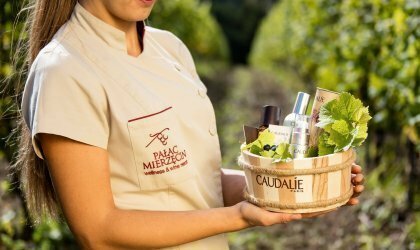 Mierzęcin Palace Wellness & Wine Resort is the only resort in Poland which has its own vineyard, a processing plant and a wine cellar. Precious tasting qualities and the well-known beneficial influence of grapes on health and beauty, which has been known for centuries, inspired us to create a unique stay offer. The grapes from the Palace’s vineyard as well as the wines prepared from them are the perfect fit for the dishes from Polish and European cuisines served at our restaurants. Grapes also constitute an integral element of beauty and care treatments at the Grape SPA – the first SPA in Poland based on fruits from our own vineyard. In the neogothic palace and in the renovated buildings of the old manor there are 76 comfortably furnished rooms. Carefully decorated interiors, interesting architecture and the surrounding park constitute an excellent scenery for various events, family meetings and meetings with friends. Furthermore, we organise trainings, conferences and integration events for companies. For this purpose we have six comfortable conference rooms, which can accommodate altogether up to 430 people, with modern audiovisual equipment. Mierzęcin Palace Wellness & Wine Resort is perfect for people who look for a peaceful rest. 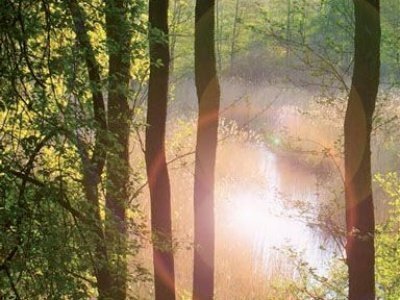 It is a quiet oasis thanks to the surrounding forests and lakes as well as to the distance separating it from the noise of the big cities. 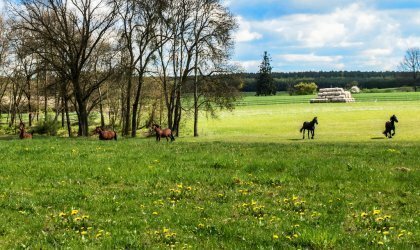 Enthusiasts of spending their leisure time actively will definitely find something interesting from our rich recreational offer – riding, a swimming pool, fitness, Nordic walking, cycle trips, kayaking trips as well as many other attractions. On the other hand, business clients will find inspiration here as well as a base offering wide and varied possibilities for unforgettable and effective meetings and trainings. The park covers an area of 15.28 hectares and occupies the northern part of the layout. 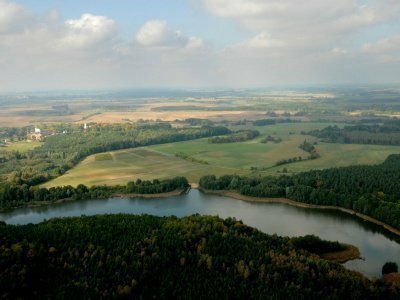 It is situated on a longitudinal ground rise, falling from the Palace towards the west and north to the boggy valley of the Mierzęcinka river. The layout of the park is planned in a multiaxial and radial structure. Moreover, it is strictly connected with the Palace situated on higher ground with a facade from the east. The three-dimensional composition of the park includes the garden ground floor with a fountain in front of the Palace. From it the main park lane leads to an intersection of twelve paths. An oblong view glade stretches, with a linden bower on its verge, from the north-eastern and main park lane side. The family cemetery, with the graves of the last owners from the von Waldow family, is located in the eastern part of the park. From the west the park descends with terraces down to the pond and to the river. Here a Japanese garden was built in recent years in stylish architecture (a bower, bridge, Torii gate). There is also an island with a Japanese lantern. The eastern part of the park is an English scenic garden with huge trees and groups of bushes on the evenly mowed lawn. An old-growth forest growing in the park is full of lush beeches, oaks, plane trees, lindens, hornbeams and elms - among them one may find over 20 nature's monuments. During the post-war period the park was neglected. It was overgrown with self-sown plants and the park lanes were destroyed and nearly disappeared. The pond was covered with weeds and slowly changed into a swamp. The restoration works taken up after 1998 helped to change the park into its present greatness. A number of roads were reconstructed, an underground watering system was installed, a stylish garden architecture was introduced several thousands of plants of some interesting and rare species were planted. Lovely location - beautiful parks and surrounding nature, cozy rooms in grape spa, helpful and nice staff in the restaurant, good breakfast. "A perfect gift for a couple." "You will be enchanted by the effective Caudalie wine therapy." Time for yourself: rest, regeneration and a dose of perfect care. Three days of rest and regeneration at the wine spa.